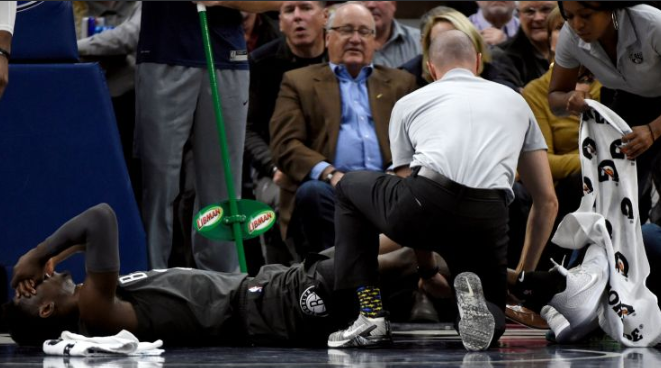 Tragedy hit the NBA community as another player suffers a gruesome injury. During an NBA game day on Monday, the Brooklyn Nets, went up against Minnesota Timberwolves, at the Target Center in Minneapolis Minnesota. During the closing seconds of the second quarter, Brooklyn Nets’ Caris Levert landed awkwardly on his right leg, after attempting a chase down block on Timberwolves point guard Jeff Teague. Paramedics immediately rushed to the scene, to carry Levert out of the Arena. He was enjoying a ten point, five assist game prior to his injury. It is painful to imagine that all that separated him from such a gruesome injury was five seconds, as the quarter was five seconds till its end. Also, this is not Levert’s first brush with injuries. He suffered a number of injuries during his high school and college years, and also his rookie season in the NBA. And as things seemed to be going well for him, he becomes unfortunate to have to deal with this major career setback. This injury is reminiscent of Gordon Hayward’s injury last season and Paul George’s during the 2014 FIBA practice game. There was a moment of silence in the arena as Levert was hauled out. Some players, team mates and opponents alike, coaches and fans, banded together to say a prayer for Levert. In all, it was a tragic day for the player and we hope he is able to fully recover.